Sounds good, you guys can count me in for sure. Would love to see an AMG blast down the 1/4 or Terry's insane 3V build. Nice times and excellent videos. I like what you've done with your car too! I've been to the San Antonio Raceway many times, mostly as a spectator. I did make a few passes over a decade ago in my 1999 Mustang but at that time you couldn't drive around the water box, so my times sucked what with wet street tires. Never did race my Bullitt there. Maybe one of these days I'll take my Mercedes AMG monster down the strip now that I know there is a new owner of the place and that it is open again. If Terry ever does make it down to San Antonio we can have a blast at the strip, racing and watching. As I remember the hot dogs were good there as well. Well guys just maybe we can all meet up and have some FUN at maybe the TX. Shootout or even the other Drag-Strip you were just on. All depends on how much Faith I have in making a round trip in mine to TX and back to Franklin, TN. by myself. I might finally have everything working as it is suppose to, finally. No extra Noises, Seeps, Leaks etc. at this time but have not put any real road miles on it since the new replacement Meziere water-pump install. I'm trying to drive it as often as I possibly can as this is now March 2016 so April will be coming up next. Say Terry, you wouldn't happen to still have those drag lite rims and tires would you? Sorry my good man those have been gone for years now. I have been known to change wheels and tires on mine a few times or so. April 5, 2014, A Memorable Day in Bullitt History! 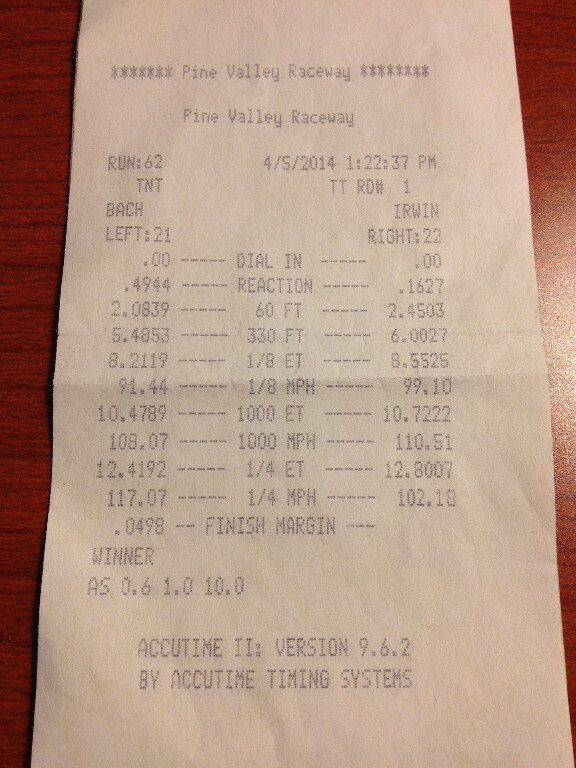 It was April 5, 2014, at the Pine Valley Dragstrip near Lufkin Texas, as part of the 2014 Texas Shootout. This was (and remains) my Best Ever Run, and it was against a certain person from Tennessee. Yes, this was the famous BLOWN FUSE run! I was in the Left lane. I clearly remember that swap too. I can still visualize it. Thanks. That would have been priceless!